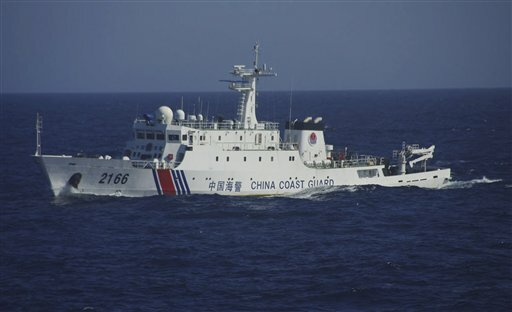 You are at:Home»China»China’s coast guard just like ours? The Chinese coast guard is in the news for straying near islands that are part of a territorial dispute between China and Japan, but if you have never seen the Chinese ships, you might have done a double-take. The Chinese consolidated several of their maritime agencies and debuted their new coast guard Monday. If their ships look familiar, it’s probably because the Chinese have modeled their coast guard after the U.S. In a June interview, U.S. Coast Guard Commandant Adm. Bob Papp told the Navy Times that the Chinese were taking cues for their coast guard from his service. “Most of them are white ships with various colored stripes on them, they’ve patterned themselves after the [U.S.] Coast Guard,” Papp said. Papp said in the interview that the U.S. Coast Guard has developed a “reliable, trusted partnership,” with the Chinese fisheries agency. “We have been dealing with their maritime agencies for a long time,” Papp said. The Coast Guard held a joint search-and-rescue training exercise with the Chinese in Hawaii in 2012, and the service will be participating in talks with China and other countries at the North Pacific Coast Guard Forum later this year in Vladivostok, Russia. Those talks will include discussing the possibility of more joint training exercises with China. So what do you think of the relationship between the U.S. Coast Guard and China and China’s move to consolidate its maritime agencies into a single one modeled after the U.S. Coast Guard? Leave your comments below. Well Chosen & Well Done China. You couldn’t have picked a finer Coast Guard, such as the USCG, to model your CG on! Careful PRC CG, that water looks deeper than 6 ft!